What are 'Related Results' and how does Loop54 find them? In addition to Direct Results, our engine generates a list of Related Results. Find out why Related Results are valuable and how Loop54 locates them. Once we receive your product feed we build a model of your catalogue - identifying and mapping the complex relationships between products. Because of this mapping, we're able to generate a list of Related Results. Imagine a visitor enters your site looking for a lovely “gown” to wear to a party. 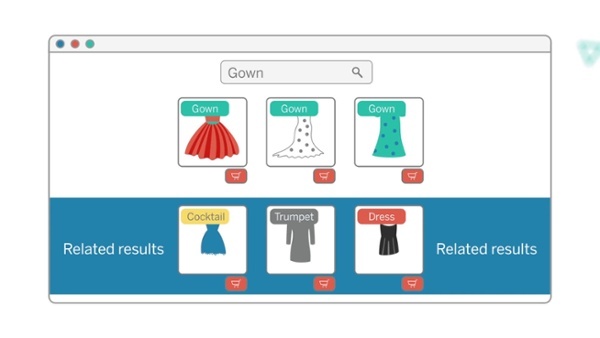 The first search results they would see are Direct Results - these are the products you have named, tagged or described with the word “gown”. All these products seem relevant enough, but what if there are better matching dresses in the catalogue and they just happen to be described with different words. Like a "Maxi Dress", "Oscar Dress" or “Ballroom wear”. Traditional search engines, which rely exclusively on text-matching to locate results, only ever present the visitor with Direct Results. This means that all relevant products would have to be manually tagged in order to be found by the engine. Not anymore! Loop54 Related Results aren’t found through text-matching. Related results are named, tagged and described with different words than those used in the search query, yet Loop54 knows they're relevant to the visitor anyway. How does it do that? 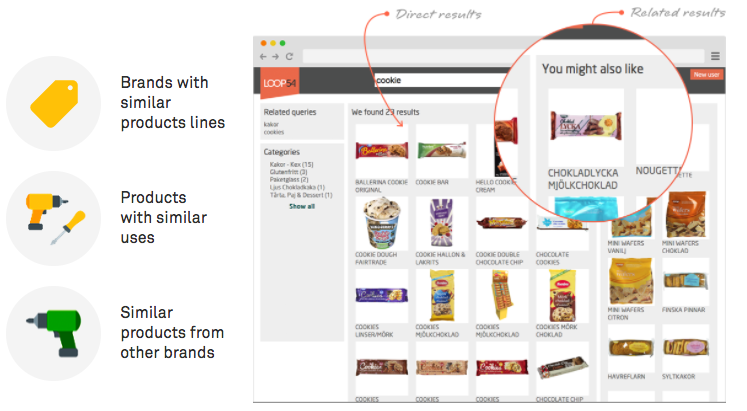 Loop54 uses AI to map the relationships between products, and with this map it knows what products are similar to the Direct Results. Because it knows that, it will show all relevant products automatically - regardless of the search query used and without any manual tagging.